Finally a new wall after almost a year. This is the result after a year break. Whether it's better or worse, I'll leave that to you. -Lineart : As you can see from the scan, it's blurry and sketched so I had to redo the lineart by hand. It's not vectored, so you will see some edges, bumps, etc on it. -Inori : I did the painting with tablet and picked the color palette of my own choice. Changes were made to her dress too. -BG : Hate to say this, but I'm not good at BG so I used a very simple idea here. Uploading Issue : I have no ZC's acc or any other image hostings' acc. The only one I have is MT for now since AP went down. Therefore, if you see my works on other sites, please inform me. Thanks in advance for comments and faves. O_O, The wall is so beautiful, It's lovely, and like... i srsly love the sakura trees and the sakura colors... (the only pink variation that i like..)... But you know... there's one thing... the lineart around inori's upper lip, that's a turn off tbh. The lines around the lip is too sharp and solid, so i'd say soften it?... I really don't like the black lines ;_;, that's the only thing that turn me off in this wall. Otherwise, everything is like PERFECT, PUR-FECT. I like how simple the background is. I like things simple, so it's a turn on for me =D. Yea I was just thinking that ripples in the water would be good too. And her dress doesn't look wet, there is no way the folds would just go up like that when drawn down by water. Made me look very hard what she was actually supposed to be standing in (I thought it was fog or something). The rest is gorgeous, I really like your style and colours. this one's really sweet! great job! http://www.zerochan.net/994512 tell me its you and not someone else tat uploaded it on zc. @XokadaidRainquester - not surprising; there's many people (who may or may not be the creator) who pull items from here and post it on Zerochan, which is an image board. If you check that person's ZC gallery, you'll see a bunch of other wallpapers from MT: ---> x - people who don't want their items appearing on ZC can get an account, and report it - requesting for it to be removed. I know, i saw these past days walls from here up there by that user. I wanted to let the creator know of the fact that their work, got legs and went for a walk. This is so pretty, Great job! Keep up the fantastic work! The vectoring is nice but then there IS really something wrong with how the perspective of the water goes - the line of the water and the water around her dress. also the trees look too big for the BG making it look flat. Quote by codon2O_O, The wall is so beautiful, It's lovely, and like... i srsly love the sakura trees and the sakura colors... (the only pink variation that i like..)... But you know... there's one thing... the lineart around inori's upper lip, that's a turn off tbh. The lines around the lip is too sharp and solid, so i'd say soften it?... I really don't like the black lines ;_;, that's the only thing that turn me off in this wall. Otherwise, everything is like PERFECT, PUR-FECT. 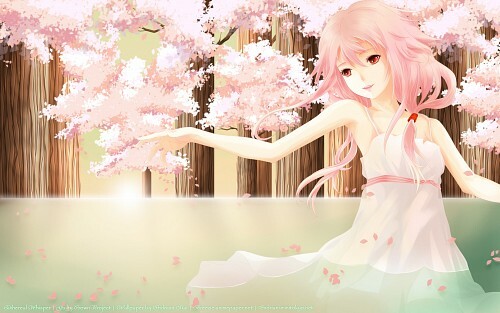 Quote by XokadaidRainquesterhttp://www.zerochan.net/994512 tell me its you and not someone else tat uploaded it on zc. Quote by SolemnSerpent@XokadaidRainquester - not surprising; there's many people (who may or may not be the creator) who pull items from here and post it on Zerochan, which is an image board. If you check that person's ZC gallery, you'll see a bunch of other wallpapers from MT: ---> x - people who don't want their items appearing on ZC can get an account, and report it - requesting for it to be removed. Regarding this matter, I hereby declare that I have no ZC's account but I might make one if that's what I need to do to take the wall off ZC's board. If anything, I only play around Pixiv.net (link to the page is provided on my AP's page). Thank you for informing me about this matter. I really had no clue at all to be honest. It was only 2-3 hours since I posted this on both AP and MT then I got these posts knowing it has got onto ZC's board already ._." exactly how it should though- looks a bit weird rather than realistic...which I believe you were going for. The trees are wonderfully detailed, however they lack to actually be apart of the wall. The water only seems to show significance on her, and there should be less opacity on the water. If you were going for a clearwater look you should be able to see her dress more as well as the trees in back. They really should be incorporated into the wall so that it brings out the whole realism on the wallpaper. thing you could try to really enhance the impact of the light on the scene. and really softened it up. Great job.